I have had a really terrible few days. Nothing big or life altering big, but annoying, aggravating and frustrating big. We just had a new roof put on and it took us a few days to realize that in the process the roofers managed to cut some electrical wires and didn’t bother to mention it. So yesterday I had an electrician tearing my house apart trying to figure out what they had done. Several hours later we hadn’t made any progress and I am now the proud owner of a large hole in my kitchen ceiling. Finally after calling the roofers and finding out that yes, indeed they did remember cutting through an old wire we managed to find the problem and get it fixed after we tore off part of the new roof. Coupled with my husband missing most of my birthday weekend because he was watching about 20 hours of jiu-jitsu and taking my son to sporting activities and parties I was feeling somewhat frustrated and uninspired to create a recipe for you this week. I didn’t intend to share this recipe with you. It wasn’t planned or thought out, it was just something I threw together with some leftovers I had in my fridge. I am not a good meal planner, I do try to think ahead and come up with a few ideas before I hit the grocery store but in general I walk around and check out the best looking produce and then decide what I’m going to cook from there. I am also highly susceptible to the power of suggestion. When I approached my seafood counter this weekend and they were offering a great deal on a whole coho salmon that impulsive part of me said, “why yes, I would love to take home 7 pounds of salmon with me today.” before my brain could really process the logic of that thinking. Needless to say after we barbecued half the salmon for tacos I found myself faced with a lot of leftovers. This is one of my favorite ways to eat in the summer, I grill up a bunch of vegetables and meat and then use whatever we have left to throw together salads, sandwiches and tacos the rest of the week. 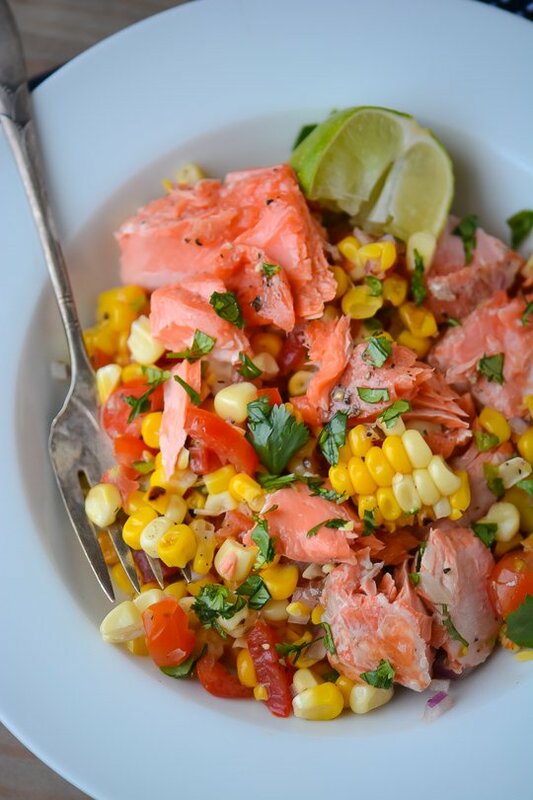 I tossed together some grilled corn, a few tomatoes, and then topped it with some smoky grilled salmon. The perfect light lunch especially on a hot day. A little addition of avocado wouldn’t hurt in my opinion either. I am optimistic that my week is going to look up from this point out. I don’t have to take my son to any after school activities for the next few days and I went crazy loading up on some beautiful plants for my backyard so I will be content for the next few days to putter around my garden and surrounding myself with beauty. I hope you all have a great and stress-free week ahead! Heat grill to medium-high. Clean and oil hot grates. Fold a large piece of aluminum foil in half and place the fish, skin side down on top. Rub fish with 1 tablespoon oil and season with salt and pepper. Place the salmon over indirect heat and then close the lid. Grill fish, until skin is crisp and slightly firm to the touch 10-12 minutes depending on the thickness of your fillet. Rub the corn with 1 tablespoon of olive oil and grill until charred and lightly cooked about 6-8 minutes. Let cool and then cut the kernels off the cob and place in a large bowl. 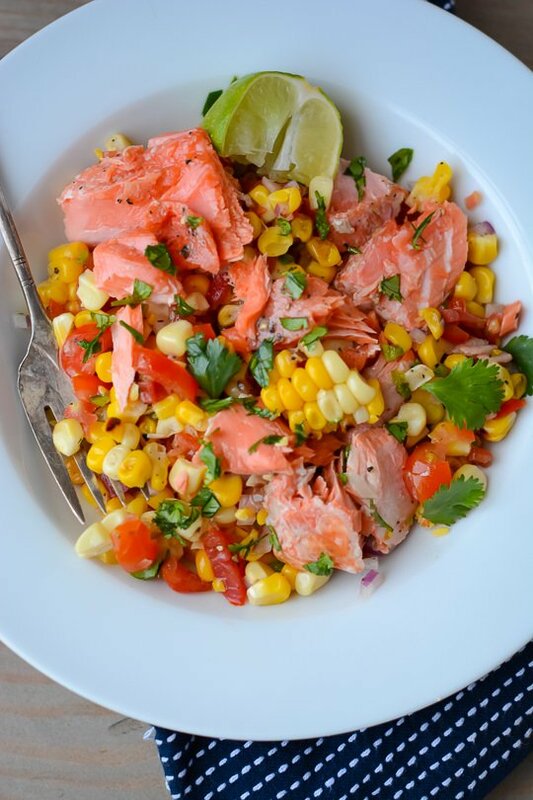 Add the tomatoes, red onion, jalapeño, cilantro, olive oil and lime juice to the corn and toss lightly to combine. Taste and season with salt and pepper. 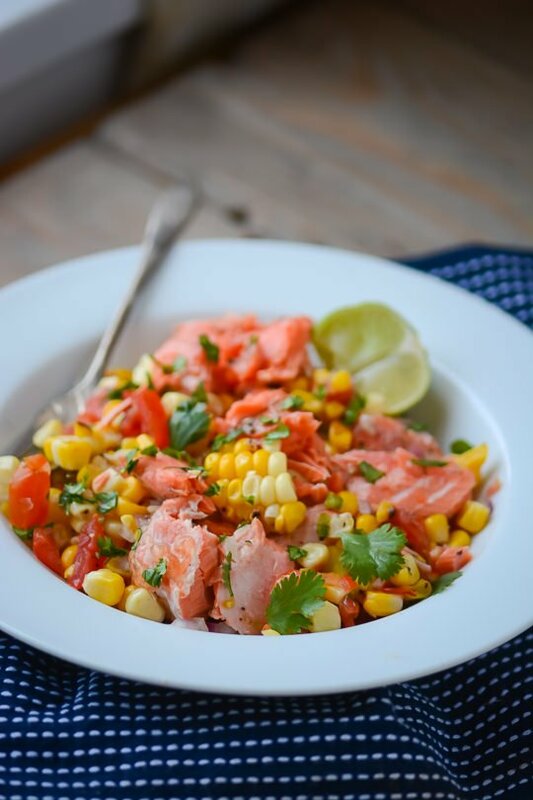 To serve, use a fork to lightly flake the salmon into pieces and place on top of the corn salad. Sometimes I don’t know if it’s a good thing for me to share some of my thoughts since they aren’t always the sunniest but I know that I appreciate it when people admit that life can throw challenges in front of them and how they deal with it. Sometimes the best recipes come from last minute meals where odds and ends from the fridge are tossed together. 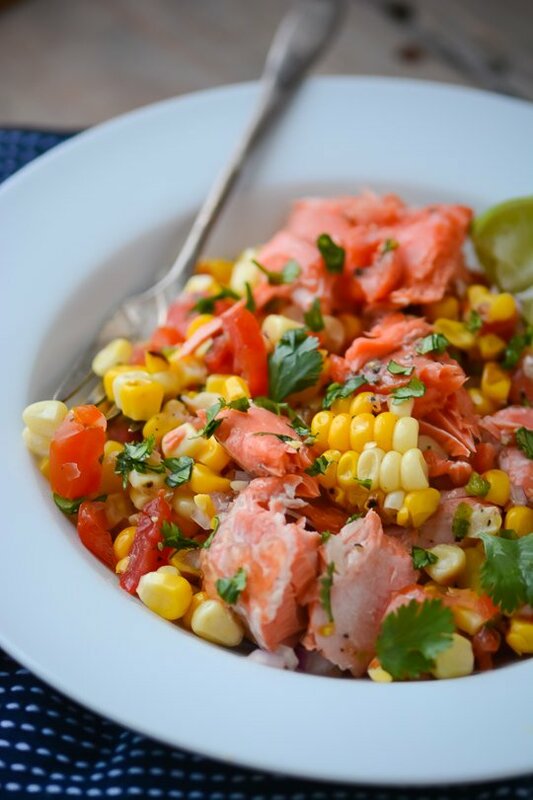 This looks like a perfect summer lunch. Hope the week improves for you! Thanks Katie. After an afternoon spent in my garden I’m feeling much more like myself. I’ve been eating a variation of this dish for the last three days and I haven’t gotten sick of it yet!